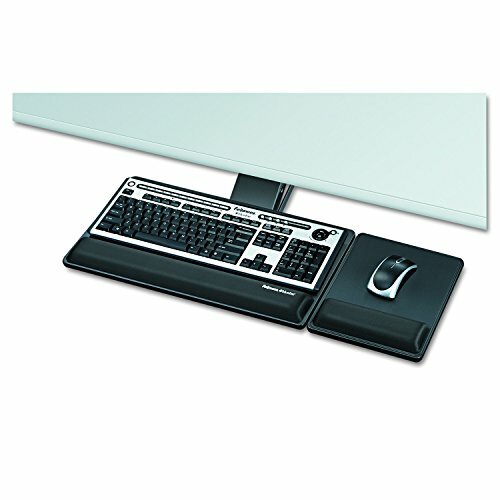 Fellowes Designer Suites Premium Keyboard Tray with Comfort-Lift system lets you slide mouse platform left or right over keyboard numeric pad and offers 2 custom height positions. Mouse platform tilts forward or backward, adjusts up or down to height of keyboard, and mounts on left or right side of keyboard. Warning Trak helps prevent mouse from sliding off platform. Loosen single knob to adjust tray height and tilt, then retighten knob to lock in position. Soothing memory foam wrist supports with Microban antimicrobial protection stay cleaner and place hands/wrists in neutral position. Non-skid pads prevent undesired keyboard movement.